Capacitive level switch CLS - 53N for pellet hopper. By order. The capacitive level switch CLS® is designed for limit (2-state) level sensing of bulk-solid materials (pellets, wooden chips, cereals, granulates, etc.) in hoppers, containers, silos, etc. 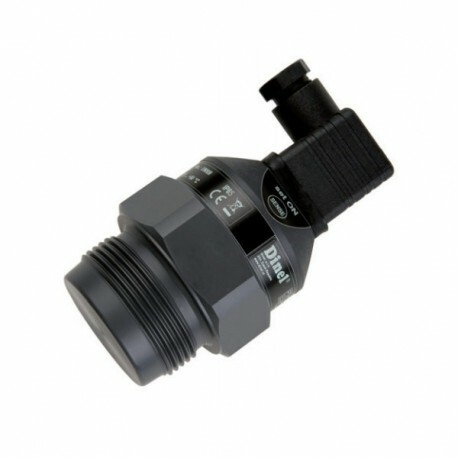 The sensor output is equipped with electronic switch. The sensitivity and output mode (normally open / closed) can be simply set by attaching a magnetic pen to the sensitive spot on the sensor housing. 2-wire connection with electronic current switch directly connected to the relay circuit. Supply voltage up to 230 V AC/DC. The sensor is not suitable for direct connection to a binary input of the control system. 3-wire connection with NPN or PNP output for connected to Dinel supply and switching units or binary input of PLC.